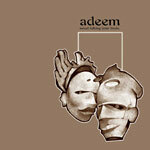 Adeem's debut album. He is also part of the Dorian 3, 1200 Hobos and Glue. This two time winner of Scribble Jam's Freestyle MC Battles lays it down with deep lyrics, and a very hypnotic flow. Production by MF Shalem, Adeem, Eclectic, ElekTro4 Moodswing9 and DJ Mayonnaise.